Canary Wharf is not really the ideal place for my kind of café. No one really lives around there and so the sense of community is lacking. Not only are the workers transient, passing through only for a quick meeting or double-macchiato to go, they are also workers from the world of finance and banking. And a lot of the food and coffee options have been tailored for these needs with high-end chains or expensive restaurants. 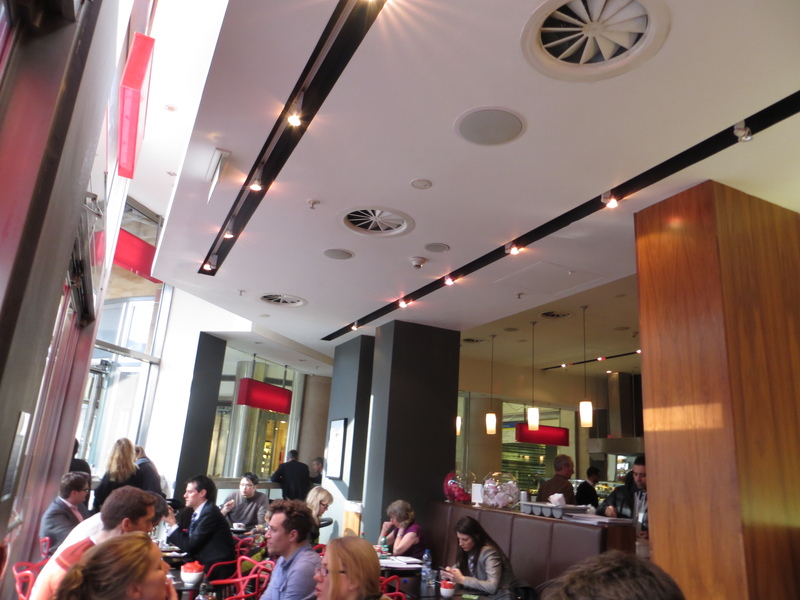 Café Brera is an Italian cafe/restaurant which has four branches – three of which are in Canary Wharf. It is a very much a modern city workers café. 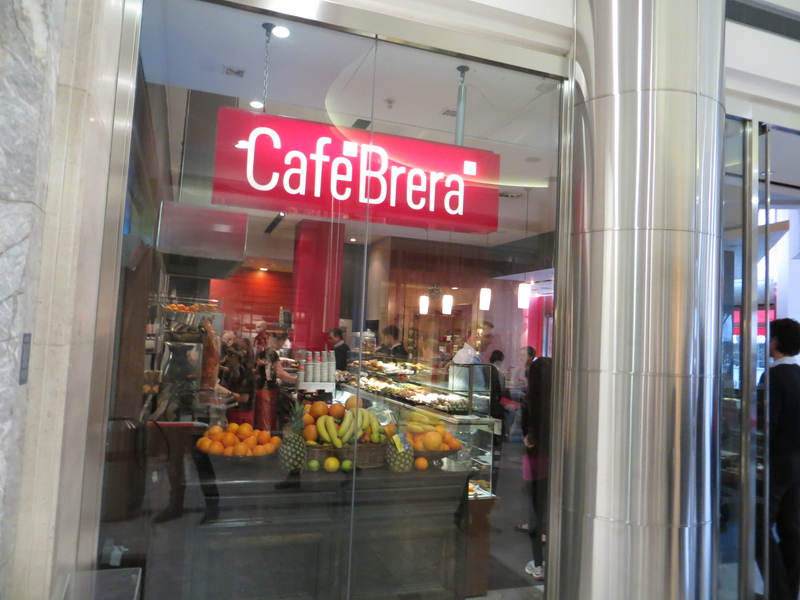 While it may look like a modern chain, Café Brera was in fact the first café in the area, opening its first store in 1991. This review is for the Cabot Square branch. Aimed squarely at people who have been working 14 hour days and need a boost, this coffee was super strong. What is lacked in taste, it made up for in power. And it’s not a small cup either, so clearly they are doubling up on the espressos. The coffee itself was bitter and a little overpowering but not unpleasant. 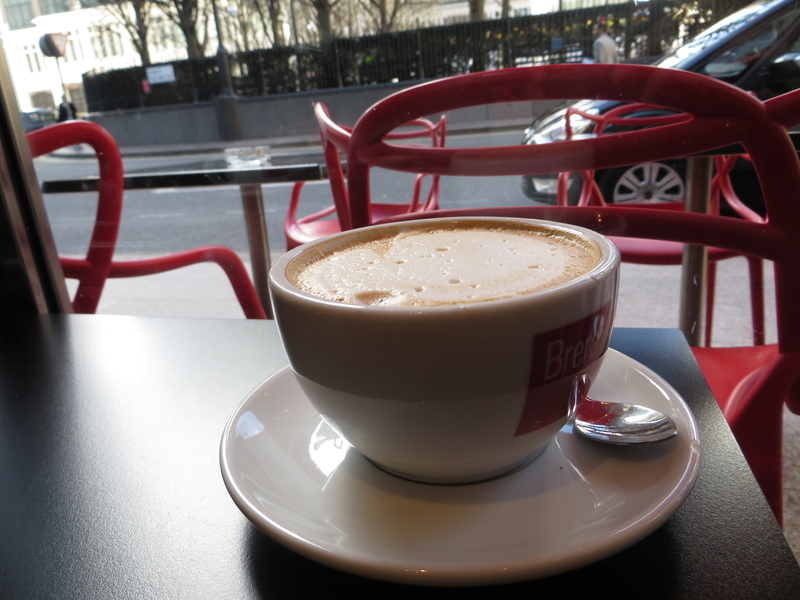 Cappuccinos range from £2.10 for a piccolo to £2.75 for a grande – good value. Atmosphere is not high on the agenda here as it’s the kind of place people don’t stop for long. Lots of big windows, tightly packed tables and plain colours give it a shopping centre café feel (it is on the edge of one of the area’s shopping centres). Though the outside area would be a pleasant place to sit on a summer’s day and the energy inside does suit its clientèle. Its Italian menu was extensive and reasonably priced. It has the expected pizza and pasta though the pizza was sat under a heat lamp, so was starting to look a little dry by the time I arrived. You can get fresh baked whole ones though. There’s also Paninis and baked good for those wanting a smaller bite. Very speedy, as is to be expected in a place like this, and done with a smile. However, it’s a little impersonal with an assembly line feel. Basically, they’ve used the Starbucks method for the drinks of ordering with one person and receiving it from another. I don’t think any of the staff would refer to themselves as baristas. As far as I could tell, there aren’t any except that it offers catering services. And why would there be – this is not the place you might come to watch live music, take a class or meet with locals. However, I did expect some over-priced art for sale. If you’ve got all this money passing through, why not try and flog them something. For its market, it’s a perfectly serviceable café/restaurant. However, its lack of atmosphere and office canteen feel, means it’s never going to be a place to revisit. I got this web site from my friend who informed me concerning this website and at the moment this time I am visiting this web page and reading very informative posts here.